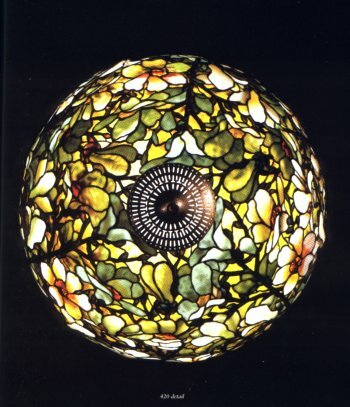 This lamp appeared in Christies December 1998 auction. In their complex floral pattern, strong coloration and elaborate use of drapery glass, the present magnolia lampshade and a similar lampshade formerly in the collection of David Geffen (see Christie's New York Magnificent Tiffany, The David Geffen Collection, December 15, 1984 lot 7) have often been regarded as the two most outstanding examples of the model. 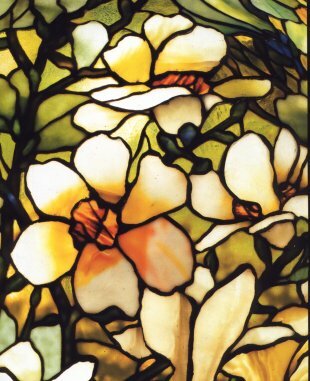 Each shade is decorated with a profusion of magnolia buds and blossoms, the latter shade having rippled glass centers in golden amber tones. Wheras the present example has an exagerated naturalistic palette in its flower petals, leaves and branches that could only have been achieved by a talented colorist in the studios, the Geffen example has a vivid sunset coloration in the glass selection that comprises the floral elements and background. The eye is drawn to the present shade's nuances of color and distinctive incorporation of textured glass in the buds and blossoms that result in an artistic and harmonious composition. The shade's variegated glass background provides a subtle backdrop against which the magnolia flowers appear vibrant and robust. 79 1/2" high, 28" diameter of the shade, with pigtail finial the shade tag stamped TIFFANY STUDIOS NEW YORK 1599, the base stamped TIFFANY STUDIOS 376, the outer rim stamped 1. ©1998, Christie's New York, all rights reserved.